Where I live, we’ve just been through the first “heat wave” of the summer. Three days where the temperature was in the mid 90s. Needless to say, people are already whining about how unbearably hot it’s been. Wusses…. My personal approaches to “beating the heat” involve sitting around the house in my underwear (who’s going to see me? ), listening to Christmas music (to distract me), and remember that it can be a hell of a lot worse. 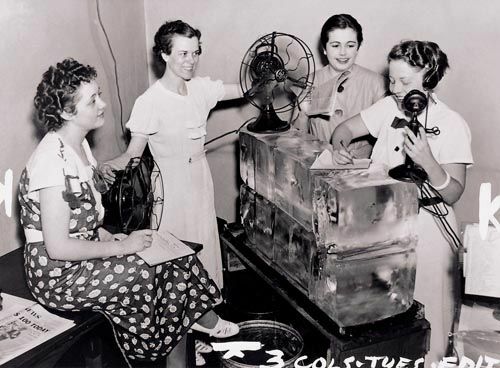 It could be as hot as it was in the summer of 1936…. In normal years, the summer weather cycle would have had the hot dry air coming up out of the deserts of the southwest pick up moisture as it reached the Great Plains, cooling it down and then dumping rain as it moved north and east. But this wasn’t a normal year. Years of agricultural mismanagement finally caught up with the farmers, and the Great Plains turned into the Dust Bowl. There was nothing there to cool off the air coming off the desert….and then the weather pattern stalled. The first assault was in Lincoln, Nebraska on June 24, when the temperature first hit 90 degrees. In two weeks, the heat spread to New York and into Canada. The three day period of July 12 -14 was the hottest three days in US history at the time, with an average national temperature of 88.5 degrees. On the 13th, every single recording station in Wisconsin (except one, on an island in Lake Michigan) recorded a temperature in the triple digits. Prior to 1936, Detroit had known only seven days where the temperature topped 100. In early July, they had seven consecutive days where it was that hot. It was considered a relief when the temperature dropped below 90 – at night. Records were set all over the country. Fifteen states saw high temperatures over 110; eight broke 120. North of the border in Canada wasn’t much better. Winnipeg hit 108; Toronto reached 106. In late July, things finally cooled off a bit in the north. For the rest of the country, the heat stuck around through August. Arkansas saw temperatures over 100 for three weeks. Heat like that melted pavement, warping roads and closing bridges. 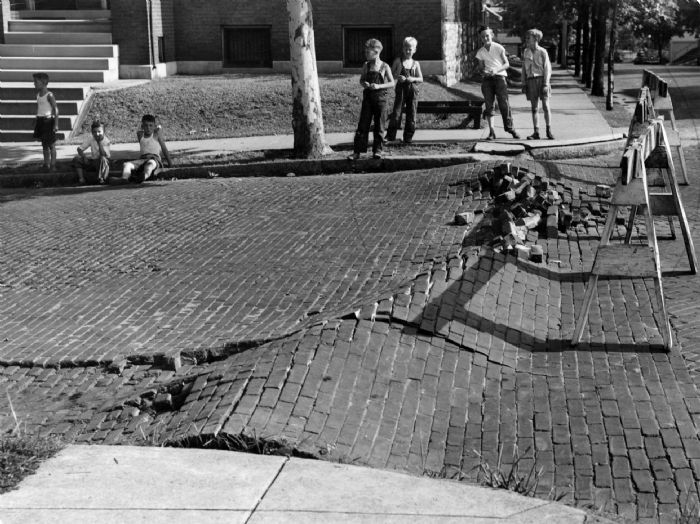 A brick-paved street in St Louis buckles from the heat. The only relief to be found was at a beach or public pool, or at a movie theater that happened to offer air conditioning. Toronto cinemas offer respite from the heat – and movies. 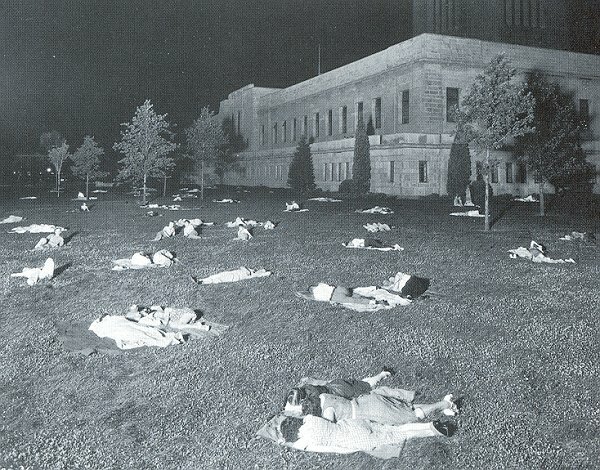 At night, people would sleep (or at least try to) outside in parks and other public spaces. When all was said and done, some five thousand people in the US and about one thousand in Canada died from the heat that summer. We don’t really have any way to understand how hot that must have been. The conditions that led to the heat wave haven’t repeated themselves…yet. We’ve gotten close; daily records set that summer are starting to fall as the whole world gets warmer. But for a sustained period of heat….. So I don’t want to hear how unbearably hot it is when the noontime temperature touches 90 for the first time in the summer. Staff at the St Paul MN Daily News keep their cool.